Geek-break! Wild Birds in Trouble! While this blog is mainly geared towards tech-stuff, environment conservation is also quite high up my list of interests. And so, allow me to take a brief pause to tech to give an appeal to all those that would read this blog. Here in my half of the globe, a small nation struggles to protect it’s natural resources. Meanwhile, a group calling itself The Bacolod Air Rifle Hunting Club shoots innocent wild birds for fun, and has the audicity to smile for a picture with their kill! And so, avid readers, I urge you to STOP THIS PHILIPPINE ENDEMIC BIRD MASSACRE by signing on in this online petition. Once it gets enough signatures (10,000 signatures), it will be sent to the media and the government, and hopefully urge the Philippine government to action against this decidely illegal past-time. There’s more than one way to offset carbon emissions, let this be one of our contributions. Thanks for taking time to read this far. I bought a webcam for my laptop for an overseas trip so I can make video calls cheaply, without researching first about the webcam’s compatibility with Linux. It’s an A4Tech Notecam Clip-On. So before any of the fun stuff could happen, I needed to know if it was working or not. After a bit of searching, I stumbled upon Camorama (it’s in the Ubuntu repositories). The good thing is that it worked! No installation, no pop-up dialogs, nothing, just plug it in, and it’s in. It came with a driver CD for Windows; take note, Windows users, my Linux box doesn’t need driver discs. Camorama can be used to test if your camera is feeding video information to your computer, and also for taking pictures or recording videos. However, for my particular camera, it couldn’t adjust the color correctly. I was worried that the linux driver for my camera had a problem. Well a badly-colored videocam feed is better than no feed at all. Next up was research. What program do I use with my webcam for video calling? Gaim/Pidgin is a multiple-IM client capable of connecting not only to Y!Messenger, but also to MSN, AIM, GoogleTalk, etc., but couldn’t do video because these companies use private and proprietary protocols with their networks they want to keep private. I wanted to be able to call Yahoo! Messenger clients, so like what I usually do when I’m clueless about something, I hit the Ubuntu Forums and do search (or post a question if search results aren’t fruitful). Sure enough, there was a thread that answered my question. After a conversation with Loell, another UF member, I tried the following applications to see which best suited my needs. Kopete is a multiple-IM for KDE, though you can still use it in GNOME. It has a nice, clean interface which I think looks better than Gaim. Trying out the webchat feature, I was able to connect to my Y!M buddies. However, while the person on the other end could see my video stream, all I got was a single frame. The first frame of what is supposed to be a video stream (at best, I managed to get another frame a few minutes later). Also, there was no audio with the webchat. First of all, I would like to state that this is my personal opinion: I really hate Gyachi’s interface. The first screen you see looks like a mess, or at best an old, unsophisticated Win95 program. The buttons are cluttered, and I really can’t make sense of the interface. But I was able to try out the webchat feature, and it worked. But like Kopete, webcam with audio was a no-go. Supposedly, you have to start audio chat aside from your webchat do get around this, but I never was able to make audio chat work either. So either I use Kopete or this for webchat without video. And I’d rather the clean Kopete interface than this. As a small saving grace though, Gyachi notifies you when your buddies sign in as invisible, so there’s no hiding from a person with Gyachi. Taking a different approach, why not just use a softphone for VoIP? Ubuntu has Ekiga by default, and unlike Skype which uses its own proprietary protocol, Ekiga is SIP-protocol compliant. In human terms, Skype can connect to Skype only, while Ekiga can connect to ANY SIP phone. Linux Skype can’t make video calls by the way, so that’s automatically out. So why not Wengo instead of Ekiga? Wengo is more fully featured than Ekiga. Wengo can be installed in Windows, Mac, and Linux, it can make SMS as well as calls to real phones anywhere in the world (I loaded it up with 10euros, which is the minimum. Calls and SMS are really cheap by the way), and it’s also a multi-IM client. In conclusion, while I never got webcamming with Yahoo!Messenger solved, it was a good learning experience, without which I would have never learned about Wengo, to which I’m casting my vote. It solved the day for webcam with voice, I just have to convince whoever I need to talk to to download the client, but it’s not that hard since Wengo is really a good client, better than Skype. It still has some kinks, which I’m sure will soon be solved by the open source community behind it as more and more people start using it. 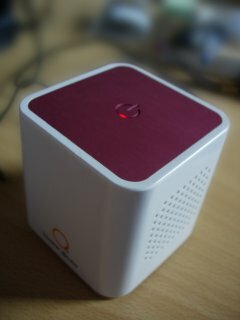 I found this cute little Speaker Cube from Eiden, an electronics store in Japan, for Y2,980. It’s small and fits right in my palm (ok maybe a bit bigger). You turn it on via the top power button. It’s powered by USB, but you can also put in 4AA batteries. It can connect to any device with an audio jack, say your laptop or your Nintendo DS. However, I have to loosen the plug on my DS for it sound properly as in the picture. But I think this is more of a problem with the plug than anything else. Works perfectly on my laptop though. Also, the 2W stereo speakers don’t give enough oomph. It’s perfect when you just need decent, portable speakers. 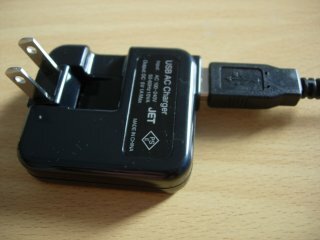 If you don’t have a laptop or PC nearby, you can also buy a wallplug to USB converter, perfect for plugging in your DS USB charger, and of course the speaker cube. With Wallplug USB, Nintendo DS, and Os Speaker @cube, you can take your music anywhere for picnics, hanging out, or other such social gathering. [Edit] I later found out that it plugs fine on my Nintendo DS. The problem, actually, was that I didn’t plug it all the way in at the back of the speaker cube, nevertheless it still sounded fine on my laptop where I first tested it so I didn’t notice. Stupid! おひさしぶり！ It’s been almost a month since my last post, my day job kept me from writing and…well, pretty much doing anything aside from work was impossible. Anyway, I’m here now, and I’m gonna start light with just some ramblings. What do you usually do when you buy a piece of hardware? You go straight home to see if what you spent on with your hard-earned money was worth it, or if it’s working at all in the first place. What you don’t do, is take that piece of hardware, say a memory module for your laptop, put it in your bag (yes, in your bag. No, I didn’t say install it in your laptop, fool, put it in your bag. Yeah, that one, over there! ), fly off to a far off country, and stay there for a couple of weeks, which is exactly what I did. All would be happy and fine if it worked perfectly, but it didn’t. Right now, I’m wondering what to do: do I send it back to my country for warranty replacement? Is it even worth it? Well, at the cost of 4,000 yen, I’d be much better off buying a new one. Well, that’s it for now. Keep tuned in, I’m gonna be trying some webcam solutions on Linux, so I might write about that some time, or maybe about some neat photography tools I found. I went to my brother’s wedding last week. During the reception was a slide show of their pictures, coupled with music. It was a great presentation. But what I noticed was that I could do this as well. The music wasn’t attached to the slide show, it was a separately playing live music. And the slide show, which was run on a Mac laptop, was the built-in Mac slide show utility. F-Spot, GThumb, or the image viewer, which are all built into Ubuntu, can do the same thing that that Mac was doing–fading in and out picture after consecutive picture. And with RhythmBox, XMMS, or your favorite media player playing in the background, you got yourself a whole Linux roadshow. Of course, getting great pictures to show is another matter altogether, but a matter out of the scope of this post. During that trip as well, I visited an old friend that now runs Photo Story Creations, a shop that puts your pictures on mugs, pillows, even tiles, as a mosaic or just a straightforward picture. Imagination’s the limit to what you can do with their products, you just need to tell them what you want to be done with your pictures. Having previously used trialware mosaic programs during my Windows days, I poked around in Synaptics Package Manager to see if I can find a mosaic application for Linux. Sure enough, there was a fast, little program called Metapixel. It´s actually two small programs: metapixel-prepare and the main metapixel program. The metapixel-prepare program lets you choose a source directory of pictures and a target directory to use as a picture library for metapixel. Creating a mosaic takes around 3 1/2 minutes, which is already comparatively faster to other mosaic programs. But this speed advantage really comes in handy when you´re making mosaics using the library, since only half a minute is used for the actual creation of the mosaic. The other 3 minutes is used for preparing the library, which is a one time deal in this case. metapixel --metapixel input.jpg output.png --library Desktop/librarydir --cheat=30 The input file is the target image that you want your mosaic will look like and the output is, of course, the final image that will be produced. Notice that I put in a –cheat=30. What that actually does is overlay a 30%-opaque final image on to the mosaic, similar to the flower mosaic above. Unless you have a really vast library of pictures with all possible colors and you’re going to create a pretty big mosaic, this option can come in pretty handy. There are also other options, like the collage option. The difference between a collage and a classic mosaic is that the classic mosaic lays out your pictures in a perfect grid, while pictures in a collage can overlap each other. Another cool tool that should be in the toolbox of the Linux photographer is Hugin Panorama Photo Stitcher. It features tools for correcting perspective, and of course, stitching tools for creating panoramas. To stitch photos, all you need to do is create points in your pictures to help the program automatically stitch your photos. In the example above, Hugin automatically adjusted for the perspective distortion effect of my camera, stitching three photos seamlessly. You may also want to check out the official Hugin stitching online tutorial. First and the last time that I’m going to Compass Cyberstation. Yesterday we needed to print an important document and I had to have it printed on A4 paper, which incidentally is THE international paper size, and which most local companies are already using. Lo and behold! They don’t carry A4 paper! So we had to walk to the nearest bookstore and buy 2 pieces of A4 paper, unfortunately, only 25-piece packs were available. After walking back to Compass and printing the document, we asked to print sticker labels on the sticker labels we brought with us. The guy manning the printer said something to the effect that they only print on bond-paper-thick paper because their printer might get damaged. So I told him, “but you have a high-end Fuji Xerox printer!” Imagine that, the guy gave me a look. I was so mad I couldn’t utter another word! So we just let it slide and proceeded to pay for the printing. They charged me P20 for the 2 pages, which isn’t much, but by principle I couldn’t understand why they were asking me to pay the full amount to print on my own paper that I bought with my own money. So I gave them P200. Heck, they couldn’t even give me the right change! The lady asked, “Sir, we lack 5 more pesos for your change, is that ok?” Lady, how few customers a day do you have to get that you don’t have a nice round number of P180 in your cash register? To anyone who happens to be in the vicinity of a Compass Cyberstation who happen to need computer or printing services, a word of advice–AVOID. In fact, try to avoid printing at all computer rental places altogether, which is what I’ll be doing from now on. Printer prices are dropping to as low as P3K or less. And even your Pentium 3s will still work like a charm on an Ubuntu. The cost of having your own computer with printer is lower than ever. For me, it’s time to buy new printer ink.